2002. University of Washington Hatchery Release Celebration. ICU, mirror mosaic sculpture on the Soul Salmon Float. Sponsor: Chimacum Creek Printing. Fiberglass, mirror. 8-foot long. The artist originated and serves as president of Soul Salmon 2001, a Northwest regional exhibit with almost 100 salmon sculptures and hundreds of sponsors, artists and patrons in a dozen locales. 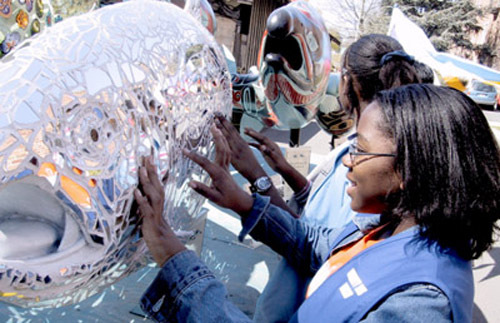 The public art display from June 2001 to April 2002 culminated in a gala auction and raised $43,000 for salmon related organizations.